-Has anyone installed a control valve on an MF 65 before? -Does anyone have any instructions available on how this can be done? My workshop manual doesn't cover this. -Would it be better to have an experienced mechanic do this for me? I was quoted $800 CAD for the parts and time. The setup in the first picture I posted was posted by someone else here on the YT forum (they did a nice job on it). Some of the MF tractors came with the longer pto lever (they had 3 different levers) the long pto lever is part number 511096M1. My 135 has the long lever like the one shown in the picture, sure is nice not to have to reach for that lever like you do the other ones. 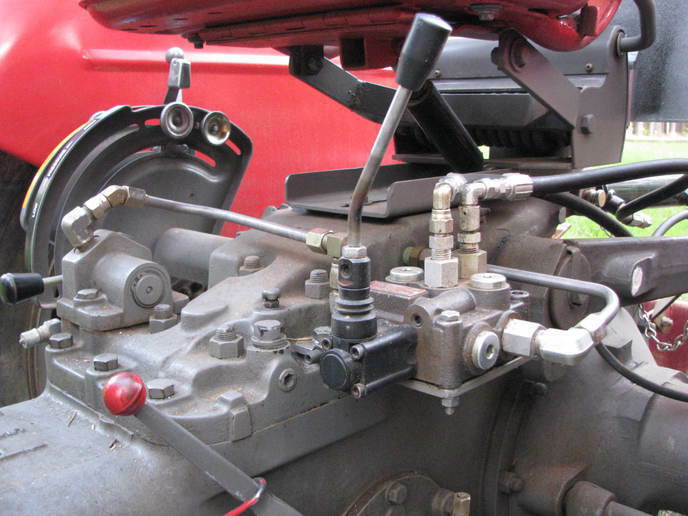 external link offers this complete kit to equip your tractor to operate 2 dual action cylinders. The only thing you have worry about is loosing the stand pipe that goes between the pump and cover when you take the cover off. The old valves that MF offered are not very good, main thing is they hamper your ability to get on, and off the tractor. All you need to do is get a pant leg got hooked on one the levers. ptfarmer, countless times grabbing the right fender to prevent dismounting head first. Your set-up in the picture looks slick. Is that a homemade pto lever ? Quote ptfarmer: The old valves that MF offered are not very good, main thing is they hamper your ability to get on, and off the tractor. All you need to do is get a pant leg got hooked on one the levers. I happen to concur with ptfarmer. With that said, I was able to install remotes by shopping around and located used parts. Yes, the controls can definitely be a pant leg catcher! On the chance you decide to look for a Massey valve from a salvage yard, they offered two. One is single acting and one is double acting. I imagine the baler requires the double acting. Oh, you loose power to the three point when you enable the remote valve. Just in case you didn't know. 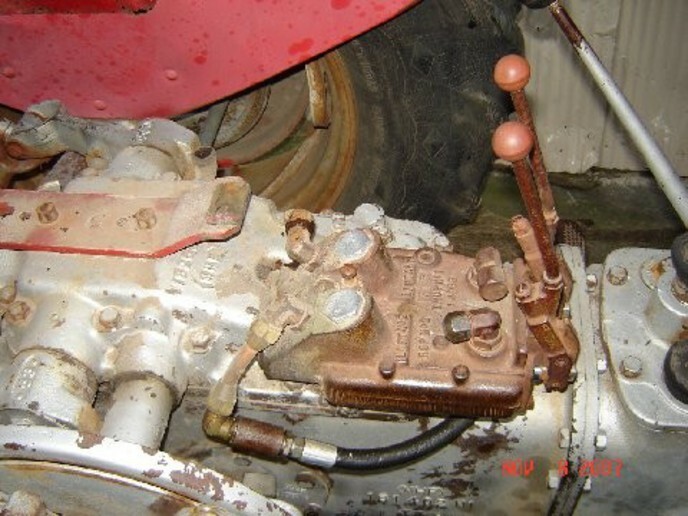 You can use a diverter valve like this https://www.yesterdaystractors.com/Massey-Ferguson-65_Hydraulic-Diverter-Valve_S60032.html you remove the plate held on with the 2 bolts on the left front of the lift cover. Then you can mount the spool valves elsewhere (for example). I have actually done this a couple of times and I don�t think it is too bad of a job. When you take the bolts off, IF you are very careful, you can use a screw driver and slowly lift the plate. Take a small pair of pointed nose pliers and hold on to the stand pipe so it doesn�t come out of the pump. The stand pipe is the key part to this, if it comes off the plate and stays in the pump, you just put the control on. If the pipe comes out of the pump, you might have to drain the oil and take the side plate off so you can see to put it back in. I did get lucky with one that I did and was able to get the pipe back in the pump without pulling the side but that might have been more luck than anything. I would say if you have a basic understanding of how everything is supposed to go, then you can probably do it yourself and save a little money. If you are buying a new valve, then you are already spending a decent amount.